#PhilipMorrisInternational is being accused of illegal tobacco advertising in Mexico. I support an immediate government investigation into these allegations! 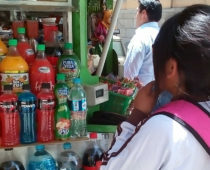 In Mexico, government agency responsible for enforcing the tobacco control law (COFEPRIS) detected points of sale in Mexico City with tobacco advertising for Philip Morris International products that violate the National Tobacco Control Law (May 2015). Secretary of Health: "Tobacco companies violates the General Tobacco Control Law"